The European Commission has just released its spring forecast, which anticipates a recession in 2012 for the euro zone (“mild” in the words of the Commission, but still -0.3%), which is in line with the OFCE’s economic analysis of March 2012. The brutal fiscal austerity measures launched in 2010, which were intensified in 2011 and tightened even further in 2012 virtually throughout the euro zone (with the notable exception of Germany, Table 1 and 1a), are hitting activity in the zone hard. In 2012, the negative impact on the euro zone resulting from the combination of raising taxes and reducing the share of GDP that goes to expenditure will represent more than 1.5 GDP points. In a deteriorating fiscal situation (many euro zone countries had deficits of over 4% in 2011) and in order to continue to borrow at a reasonable cost, a strategy of forced deficit reduction has become the norm. This strategy is based on declarations that the 3% ceiling will be reached by 2013 or 2014, with balanced budgets to follow by 2016 or 2017 in most countries. However, these goals seem to be overly ambitious, as no country is going to meet its targets for 2013. The reason is that the economic slowdown is undermining the intake of the tax revenue needed to balance budgets. An overly optimistic view of the impact of fiscal restraint on activity (the so-called fiscal multiplier) has been leading to unrealistic goals, which means that GDP growth forecasts must ultimately be systematically revised downward. The European Commission is thus revising its spring forecast for the euro zone in 2012 downward by 0.7 point compared to its autumn 2011 forecast. Yet there is now a broad consensus on the fact that fiscal multipliers are high in the short term, and even more so that full employment is still out of reach (here too, many authors agree with the analyses made by the OFCE). By underestimating the difficulty of reaching inaccessible targets, the euro zone members are locked in a spiral where jitters in the financial markets are driving ever greater austerity. Unemployment is still rising in the euro zone and has hardly stopped increasing since 2009. The cumulative impact on economic activity is now undermining the legitimacy of the European project itself, and the drastic remedy is threatening the euro zone with collapse. 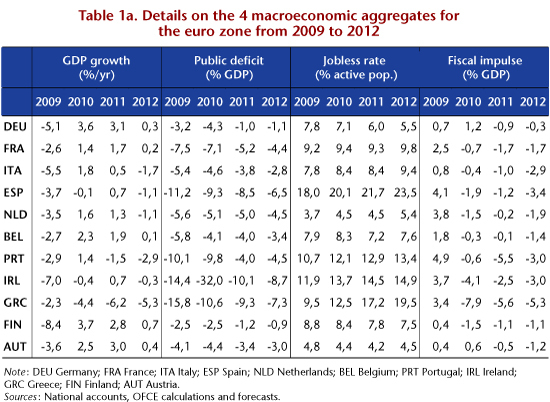 What would happen if the euro zone were to change course in 2012? Assume that the negative fiscal impulse in the euro zone is on the order of -0.5 percent of GDP (instead of the expected total of -1.8 GDP points). This reduced fiscal effort could be repeated until the public deficit or debt reaches a fixed target. Because the effort would be more measured than in current plans, the burden of the adjustment would be spread out more fairly over the taxpayers in each country, while avoiding the burden of drastic cuts in public budgets. Table 2 summarizes the results of this simulation. Less austerity leads to more growth in all the countries (Table 2a), and all the more so as the fiscal consolidation announced for 2012 intensifies. Our simulation also takes into account the impact of the activity in one country on other countries through trade. Thus, Germany, which has an unchanged fiscal impulse in our scenario, would experience an 0.8 point increase in growth in 2012. In the “less austerity” scenario, unemployment would decline instead of continuing to increase. In all the countries except Greece, the public deficit would be lower in 2012 than in 2011. Admittedly, this reduction would be less than in the initial scenario in certain countries, in particular those that have announced strong negative impulses (Spain, Italy, Ireland, Portugal and … Greece), which are the ones most mistrusted by the financial markets. In contrast, in some countries, such as Germany and the Netherlands, the government deficit would shrink more than in the initial scenario, with the indirect positive effect of stronger growth outweighing the direct effect of less fiscal consolidation. For the euro zone as a whole, the public deficit would be 3.1 percentage points of GDP, against 2.9 points in the initial scenario. It is a small difference compared to more favorable growth (2.1%), along with lower unemployment (-1.2 points, Table 2) instead of an increase as in the initial scenario. The key to the “less austerity” scenario is to enable the countries in greatest difficulty, those most obliged to implement the austerity measures that are plunging their economies into the vicious spiral, to reduce their deficits more slowly. The euro zone is split into two camps. On the one hand, there are those who are demanding strong, even brutal austerity to give credibility to the sustainability of public finances, and which have ignored or deliberately underestimated the consequences for growth; on the other are those who, like us, are recommending less austerity to sustain more growth and a return to full employment. The first have failed: the sustainability of public finances has not been secured, and recession and the default of one or more countries are threatening. The second strategy is the only way to restore social and economic – and even fiscal – stability, as it combines a sustainable public purse with a better balance between fiscal restraint and employment and growth, as we proposed in a letter to the new President of the French Republic.